My manager had shown me a really cute robot book by David Carter a couple of months ago that I have been waiting for the right time to use, and since I already had robots on my mind because of the DoodleBot program I would be doing with a group of school-aged kids the same day, I decided I might as well do a Robot storytime as well. We started with our welcome song, then I introduced the topic and the kids seemed really excited about it. We then sang our story song and started on our first book, Boy + Bot by Amy Dyckman and Dan Yaccarino. 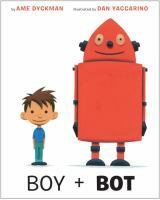 This is a really cute story about a boy and a robot who meet by chance and start playing together. But the robot's power switch accidentally gets turned off, and the boy thinks he is sick and takes him home and tries to take care of him. Later, the robot's switch gets turned back on, and when he sees the sleeping boy he thinks there is something wrong with him! The illustrations have a nostalgic 50's sci-fi feel as well. Five little robots in the toy shop. Small and shiny with antennae on top. And bought a (color) robot and took it away! They really enjoyed this and asked to do it again. 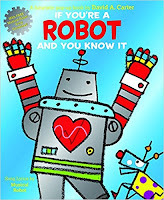 Then it was time for the new book, David Carter's If You're A Robot And You Know It, which is obviously based on the traditional children's song, "If You're Happy and You Know It". 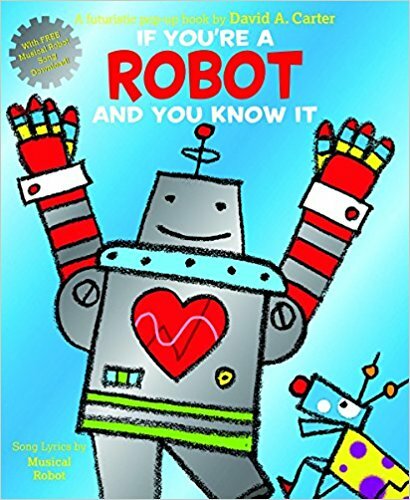 This book has really fun pull-tabs that make the robots act out the various actions, including traditional ones such as clapping hands or stomping feet, as well as robot actions like "shoot laser beams out of your eyes". This book is very cute and a lot of fun, and the kids insisted on doing it twice as well. Then to finish off with our last story, Beep! Beep! Go To Sleep! by Todd Tarpley and John Rocco. This is a super cute and funny story that parents can definitely relate to! 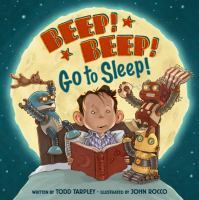 A boy is trying to put his three little robots to bed for the night, and just when you think they're asleep (and the rhyming text leads the kids to say "asleep"), you turn the page to hear "Beep! Beep!" and discover they are NOT asleep. Instead they have all kinds of excuses like "my sensors ache", "my fan belt's loose", "I need more oil"... This happens over and over, with the boy becoming increasingly frustrated with them. Finally he agrees to a bedtime story, and in the end it is the boy that is asleep. Because, after all, robots are machines; they don't need sleep! We ended with our story song, and passed out stickers. The kids were excited about the topic when I told them, and really seemed to have a lot of fun with it. They liked both stories, and really loved getting to pretend to be robots with If You're A Robot And You Know It. Several of them denied ever making excuses to get out of bed like the robots in Beep! Beep! Go to Sleep!, but a few did admit to asking for water or a night light. This was an outreach storytime, so no parents, but I think this book would really be great for a family storytime. I think all of us parents can relate to the many excuses to put off bedtime!